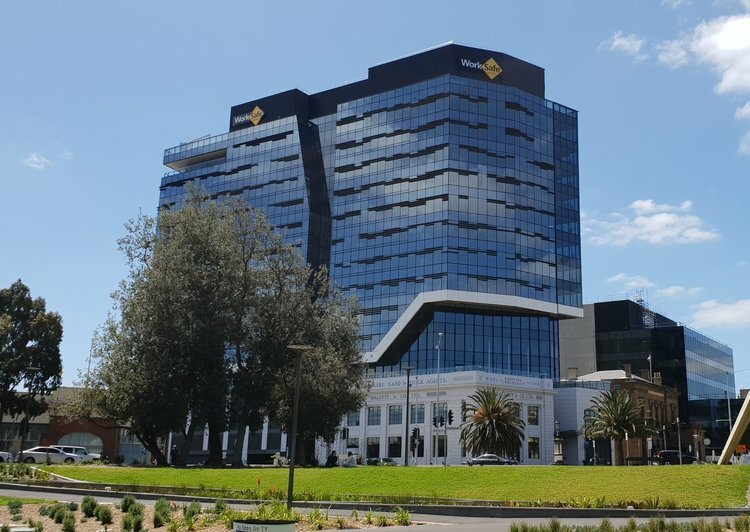 The new WorkSafe building is only 12 stories with 264 stairs and would present a very different style of race to the usual skyscrapers that make up the Australian racing scene. Short races like these are popular in Europe providing fast times and close results. Maria and I turning up Geelong ready to race up this tiny building but when we first caught sight of it up close Maria got nervous and I started to wonder if I could go full gas all the way. With plenty of other events going on as part of the day the stair race wasn’t the main focus and we could choose when to do our run. After a bit of a warmup we went to the start area and prepared to go. I was first off and hit the stairs as fast I could. There were 20+ stairs per flight with a landing half way up. At some of the turns the stairs started immediately while at others there was 1-2 metres of flat before the stairs started. A wall between the stairs meant you couldn’t see what was coming so it was a little hard to get a rhythm going. But with only 12 stories it wasn’t so much about rhythm, it was about speed. The first few flights went by quickly and I felt good. By the time I looked up to check my progress I was at the 8th floor and I was starting to battle my body. My legs were burning and I was breathing hard. The last four floors were hard as I pushed to maintain the pace I’d set myself. Before long I was at the top, a short corridor, hard right turn, finished. The feeling after such a short race is much like I feel at the top of a long climb: completely out of breath, legs screaming at me to stop doing this. 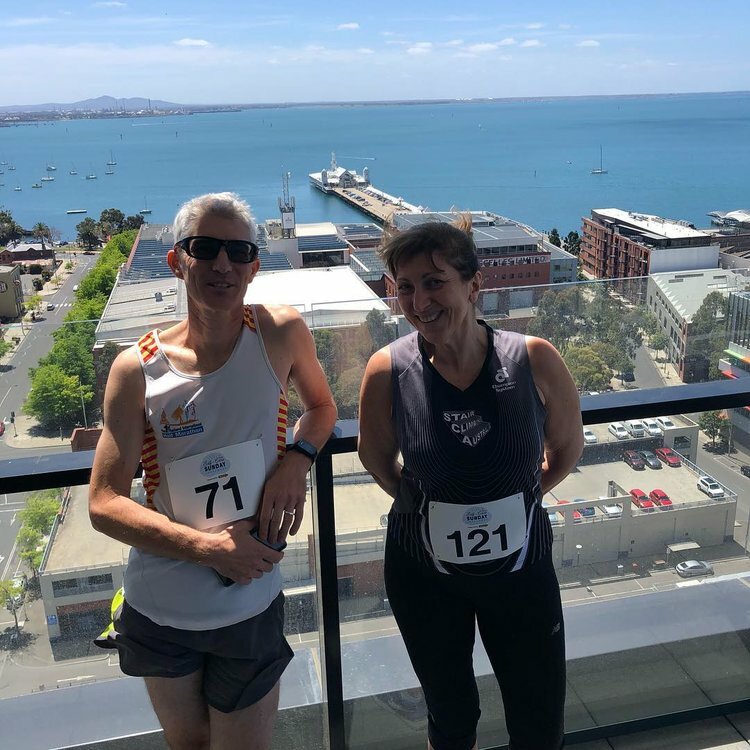 The nice thing is that the recovery is much faster and before long I could enjoy the amazing view of the Bay and the city of Geelong. The building is really well located and designed with the top floor as a common kitchen and dining area for the staff who work at the building. The designers have decided the view should be for everyone, not just the top managers as would be done in many buildings. Maria got to the top happy with her run but wishing she’d pushed a bit harder. All her training for Eureka is about an even pace and working to hold it for a long period of time. This building was all about going hard. We checked our times with the Tomato Timing person. I did 1:13 and Maria 2:36. We were the fastest male and female times of the day so far. It was always my intention to do at least two runs so down I went to try again. I usually go faster on a second run so I was hoping to knock a few seconds off my time. Second time up was much harder. To start with the feelings were similar to my first run as I remember getting to the 8th floor and then battling with myself to keep the pace high. But this time I had to battle harder and I was convinced I was going slower so I probably gave up a little. I crossed the line feeling very rough and took a little longer to recover this time. So it was with surprise that I was told I had done 1:12, one second faster than my first run. This was both annoying as I wished I kept pushing at maximum effort. Maybe I had another second or two in me. Ah well. A great result for my first short race. Maria and I waited around for most of the day and in the end were presented with the winner’s prizes for fastest male and female. For me it was my second stair race win, but even better for Maria as it was her first ever victory! We each received a nice Lululemon box of goodies for our efforts. A big thank you to West Geelong Rotary and Amy, the event organiser, for putting the event together. We are planning to work closely with them next year to grow the stair climbing part of the day. 75 people did the stair climb on the day which we count as a great success for a first time event and for being in a regional city. Look out for this one on the calendar for next year and if you live in Melbourne join us for a great day out in Geelong.